Exactly one year after she got the tricycle, she decided she'd bother with riding it... and she's AWESOME at it! She can go forward AND backward, ride around in a circle OR straight line. She can ring her little bell. She can give rides to Oatmeal. There's no stopping her... until she actually tries to stop herself. 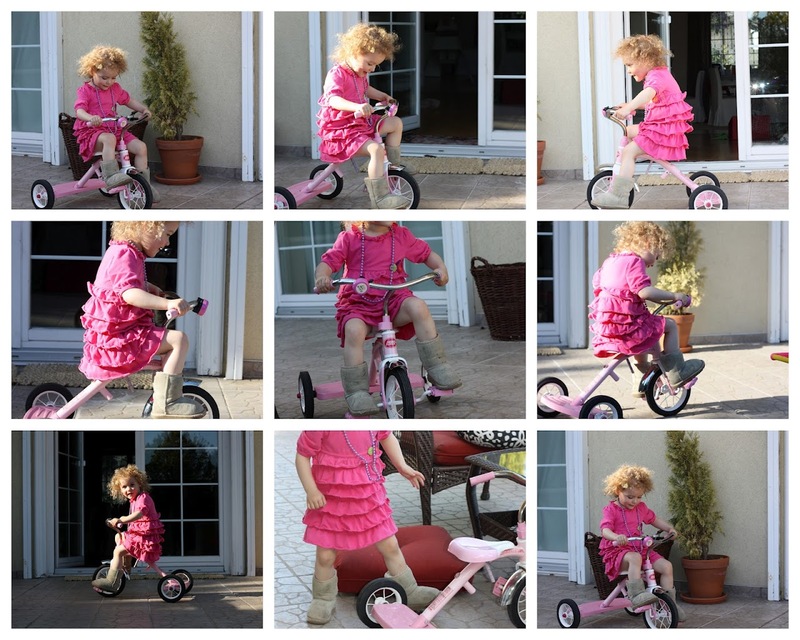 When going to "park" the tricycle, she made a wrong turn off the patio and took the tricycle down a few steps. Found her like this. Tricycle upturned, but still smiling. Tire marks all over her "riding boots" and legs. Next time, and every time, we will make sure to wear a helmet. Always wear a helmet. And knee pads. And maybe pants too. Ok ok, so I just got through catching up! I cannot say it enough: your babies are DARLING!! So glad y'all are doing great and thriving in every way!! Audrey has a red one just like it and says faster faster!! I even has a spot for little brother to stand, when he starts standing! Love it! !